I stood smashed in a pit below the final podium presentation in Denver last Sunday when someone behind me asked "What is the orange jersey?" "Most Aggressive rider," I instantly responded. "Most Courageous," another one of the smooshed fans or media members nearby called out (I couldn't tell which because I couldn't move an inch to turn and look). I have this thing about being squished in a crowd, that thing would be - I hate it. It reminds me of being at the barriers in the mass of a million fans on the Champs Élysées for the the final day of the Tour de France. I shuddered and wanted out immediately. But this past Sunday I hung in there, if for no other reason than to feel the spray of celebratory champagne during the best team presentation and to see the joy on Ben King's face up close as he was presented with his latest-model orange jersey for a race well fought. So what is the correct award names for the stand-out rider who gives their all on the stage? You will know the rider by his dossard rouge (red bib) with white number. You will know the rider by his red dossard with white number. You will know the rider by his green jersey. You will know the rider by his yellow and blue jersey. This race is sponsored by pharmaceutical company Amgen and the jersey sponsored by Breakaway from Cancer where aggressive is a bad word and courageous a good word. You will know the rider by his orange, gray and white jersey. I like their words to describe the winner: "It will be awarded to a cyclist who demonstrates–in the face of all adversity–the greatest desire to win in that day’s stage". You will know the rider by his orange and white striped jersey. These awards are decided upon by a jury and not by any points system (another way of saying they are incredibly subjective). But we could also call this jersey the "He who hogged the camera coverage all day" jersey, or the "He who just rode the entire stage alone only to loose" jersey, or perhaps "He who tried his best but got caught in the last 500 meters" jersey. At the Giro d' Italia the Most Combative is actually a different type of award, more of a best overall rider award. It goes to the rider who scores the most combined points for stage finishes, Intergiro sprints, and climbs. The Vuelta a España awards their white jersey in a similar way. Assigning their white jersey as the Best Combined (Classification General Combinada) for the rider highest placed in overall, sprint points, and climber points. The Vuelta a España is currently in full-swing in Spain. So be on the lookout for the blue and white polka dot jersey, not the red and white polka dot jersey. This gets confusing. Don't assume the jerseys are all the same race to race, they are not - yellow is not always yellow. Grand Tour jerseys are not all created equal. According to UCI rule 1.3.071 and 2.6.0.18, there is a specific order of priority of jerseys. The classification jerseys take precedence in order of yellow, green, polka-dot, white. 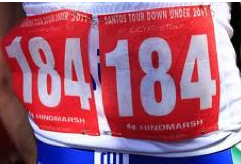 If a rider is already in a more prominent jersey and has earned one or more, he will be awarded with the jersey on the podium but the second-place rider in the classification will where that jersey the next day during the race. 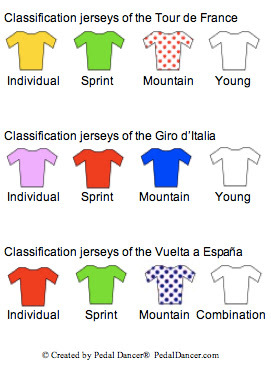 Also the World Champion jersey trumps any National Champion jersey, but the classification jerseys trump the world. 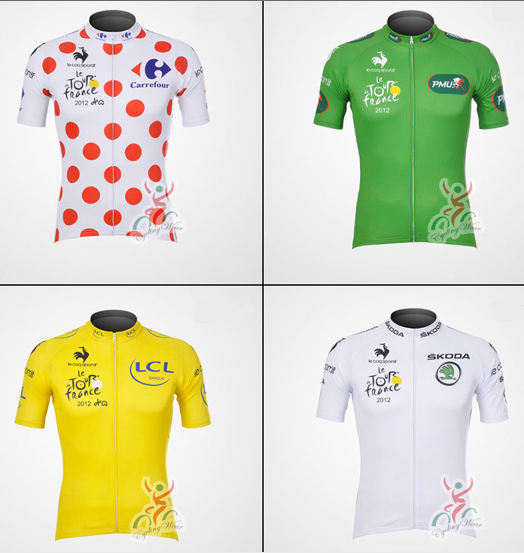 Here were the 2013 classification jerseys of the Tour de France. This is the gold standard, but varies race to race. So who was the most Aggressively Courageous and Combative rider in 2013?